When learning how to cook cod you will find how easy it is. Like most fish it cooks very quickly. Being a very mild white fish all kinds of great ingredients can be added to it for special flavors. One of the most popular cooking methods for this delicious firm fish is by deep frying. It makes such a good sandwich when deep fried or even pan fried. Cod filets can be dipped in egg, buttermilk or milk and then dredged in various breading like seasoned flour, cornmeal or a mixture with different spices. There are many recipes for cooking in the oven and on the stovetop as you will find when learning how to cook cod. With both methods vegetables and other ingredients are added to the fish totally changing the flavor. This is one fish which is also often used in soups, stews and casseroles. Because it is easy and quick cooking, the broiler is another great method of cooking. Added flavor can be as easy as sprinkling with salt, pepper, lemon pepper, dill or other seasoning. 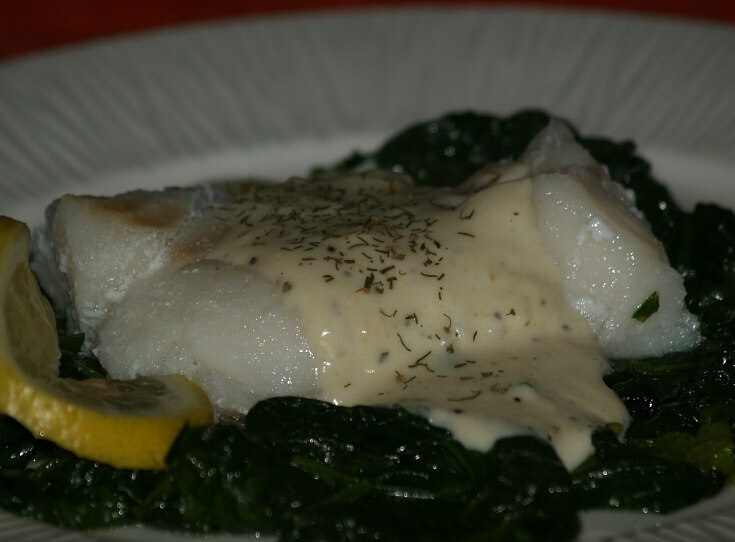 Warm lemon butter with a little garlic makes an excellent condiment to serve with broiled cod. Poaching or steaming is a very common way of cooking fish producing a light finish taste. I remember from years ago, doctors and even Weight Watchers would instruct the poaching and boiling methods as healthy ways of cooking fish. I do not recommend boiling for filets or steaks because they cook too quickly for placing in a lot of water. (Remember this when making soups; serve as soon as fish is done.) I always thought it to be very bland tasting by cooking in any water but I found herbs and spices really give it flavor. Many sauces also add a lot of flavor. Many are not so healthy but certainly do make delicious fish recipes. Poaching is done with liquid; water or fish stock usually. If you want to poach whole fish you will need a fish poacher. Smaller steaks and filets can be easily done with a steamer, saucepans or skillets with lids. Place fish filets in a steamer basket over boiling water. If using a saucepan or skillet also start with boiling liquid. Unlike boiling (With a lot of water) you only need a little liquid for poaching fish. It usually only takes about 7 to 8 minutes to cook steaks or filets until done at the flaking stage. If not using a basket, carefully lift the cooked fish out with a spatula. Learn how to cook cod with a pretzel coating. Combine eggs and milk; mix well. Combine and blend eggs, milk salt and pepper. Dip fish into egg mixture and coat with crushed pretzels. Fry fish in hot oil until golden brown and fish flakes. 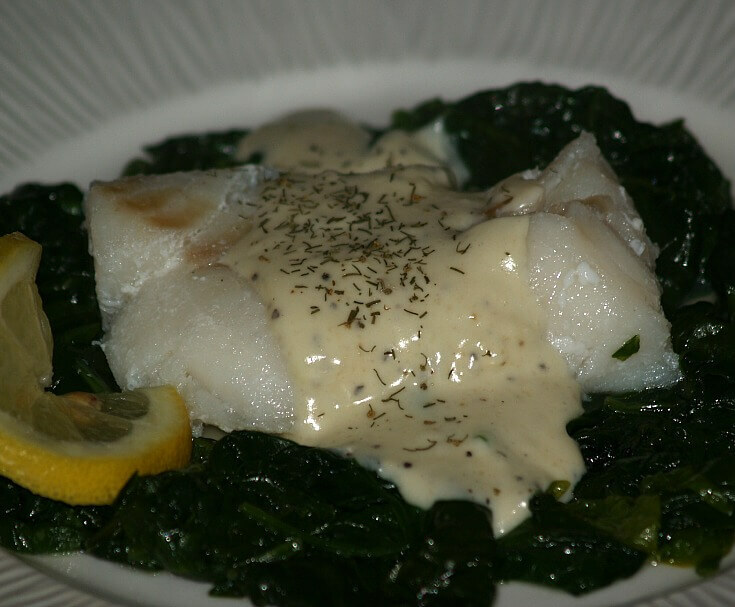 Learn how to cook cod with spinach and mustard sauce. TO MAKE SAUCE melt 2 tablespoons butter in saucepan over medium heat. Stir in flour to a smooth paste; add cream and stir until smooth. Add mustard; season with salt and pepper. Continue stirring and cooking until slightly thickened. Set sauce aside and keep warm while finishing recipe. TO COOK SPINACH rinse in cold water, remove stems and drain well. Cook over high heat stirring until limp; drain off and squeeze out excess liquid. Melt ¼ cup butter in saucepan; sauté spinach tossing until well coated and hot. Season with salt, pepper and nutmeg; keep hot. TO COOK FISH poach fish filets until flaky when tested with fork (See above info). Serve fish with spinach and mustard sauce; Garnish with lemon slices and dill. Learn how to cook cod by skillet cooking. Rinse fish fillets and pat dry; Combine flour, salt and pepper in a shallow dish. Dredge fish fillets in seasoned flour mixture; place in skillet without touching. Cook filets 4 to 5 minutes; carefully turn over with a spatula. Finish cooking until flaky about 4 minutes; lift onto plates with spatula. Combine potatoes, onion, leek, tomato, garlic and oil in a large soup pot. Stir and cook over medium heat about 10 minutes. Add water, bouquet garni, orange rind and saffron to pot. Add cod to pot; cook about 15 minutes longer until fish and veggies are done. Place a slice of bread in each large soup bowl. Sprinkle bread with parsley; spoon soup on top. Learn how to cook cod in the oven with rosemary. Place fish in a buttered casserole baking dish; sprinkle with seasoned bread crumbs. Pour wine and lemon juice over the fish; bake for 15 minutes. Dot filets with herb butter and bake 10 minutes longer. COMBINE and mix all ingredients; makes 1 cup. COMBINE and mix all ingredients until well blended; let stand a couple hours for good flavor. Learn how to cook cod seasoned with bacon. Brush cod with oil; season with salt and pepper. Place under broiler and cook 8 minutes; turn over and cook 7 minutes longer. Melt butter in small saucepan (Do not brown). Place cod on warm serving plates; crumble bacon on top. Pour melted butter over the top; sprinkle with lemon juice. Garnish with parsley sprigs and lemon wedges. 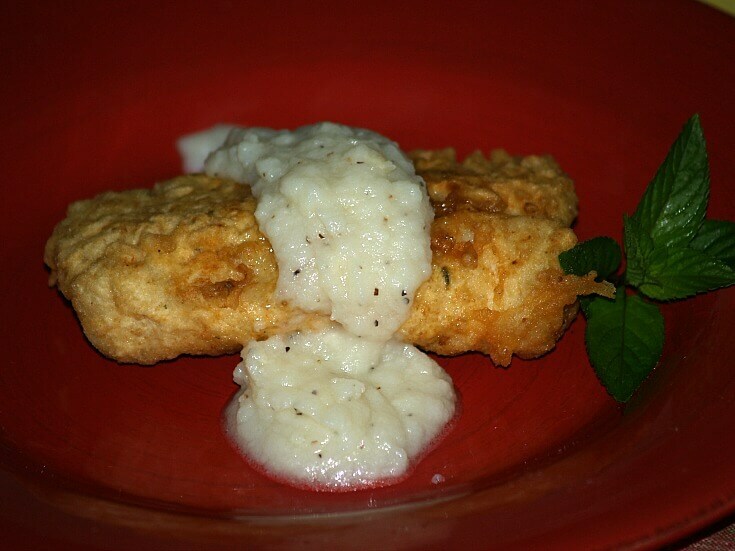 Learn how to cook cod and serve as appetizers. Combine cod and mashed potatoes; season with salt and pepper. Shape mixture in small round balls; dip in egg and then roll in breadcrumbs. Fry in hot deep oil (360F degrees) about 5 minutes; drain on paper towels. Place on serving platter and serve with cocktail sauce. TO MAKE MARINADE first cut fish in fingers about 2 ounces in each. Place fish fingers in a glass shallow dish. Combine and mix lemon juice, Worcestershire, salt, pepper and vegetable seasoning. Pour marinade over the fish, cover and refrigerate for several hours turning to coat. Remove fish from marinade and drain; DISCARD marinade. Heat oil to 375F degrees. Dip fish in batter and fry about 5 minutes turning to brown both sides. FOR BATTER combine and mix flour, salt, sugar and pepper; set aside. Combine and beat together with whisk water, yolks and beer. Slowly add dry ingredients to liquids beating with a whisk. When mixture is smooth stir in the baking powder. Makes 4 cups batter; enough for 3 pounds fish. FRY potatoes according to package directions; serves 12. Learn how to cook cod with onions and dry white wine. Combine and blend lemon juice, salt and pepper in shallow dish. Place cod filets in mixture turning to coat; set aside. Heat oil in a large skillet; sauté onion and leeks until tender. Add cod with any juices to the skillet; add dry white wine. Sprinkle with parsley before serving; serves 4 to 6. Learn how to cook cod in flavorful tacos. Combine and blend sour cream, green onions, cilantro and lime juice; set aside. In shallow dish combine paprika, garlic powder and salt and pepper to taste. Sprinkle spice mixture over cod filets on both sides. Heat a little oil in a large skillet over medium heat; place cod in skillet. Sauté filets about 3 to 4 minutes on each side until opaque and flaky. Place fish filets on warmed tortilla; top with sour cream mixture and slices of avocado. Serve with salsa; make as many as you like and REMEMBER they are delicious. Learn how to cook cod; fried with garlic potato sauce. Combine 1 cup flour, salt and pepper; blend well and set aside. Mix 1 cup flour with the water; blend until smooth. Pat fillets dry and coat with seasoned flour; dip into flour batter. Pour oil about 1 inch in deep skillet; when oil is hot put in fish. Fry until golden brown turning one time. Drain and serve with garlic potato sauce; serves 4. Boil potatoes until tender; drain in colander then on paper towels. Mash potatoes in potato ricer; add garlic. Beat potatoes with mixer gradually adding olive oil. Beat in vinegar; season with salt and pepper. If sauce is too thick add a little more olive oil. Learn how to cook cod in the oven with anchovies. Heat half of the oil in a flameproof casserole. Add the anchovies to the casserole and thoroughly heat. With a fork mash the anchovies well; transfer to a bowl. Put a little of the mashed anchovies inside the fish. Add a few sprigs of fresh rosemary and basil inside the fish. Place fish in the casserole dish. Mix remaining mashed anchovies and remaining oil; pour over the fish. Add a little more rosemary; sprinkle with bread crumbs, salt and pepper. Bake 30 minutes until fish is golden and flakes.